In the emulator it is possible to mount the archive as a CD ROM drive? Is there a solution for such tasks? Yes, you can mount an ISO. 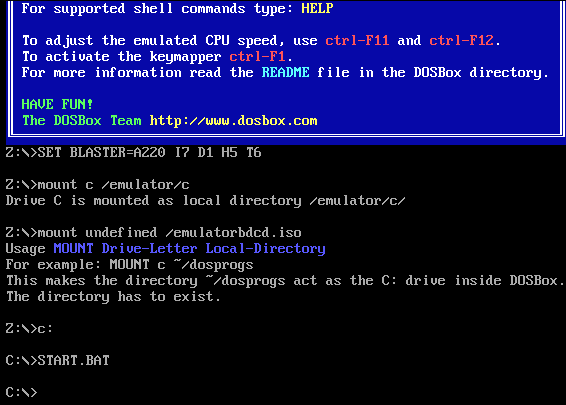 Simply use mountFile as normal to download the ISO file, then use extraArgs to give DosBox an imgmount command using that ISO (http://www.dosbox.com/wiki/IMGMOUNT). JSMESSLoader is merely a synonym for MAMELoader, and is provided so that we don't break existing users. And in the file loader.js I did not find the function extraArgs, which interacts with dosbox. Perhaps I have an outdated version. Despite the fact that I use files from this repository. You're right; I don't know how I ever overlooked that. I've committed a change that adds an extraArgs method to the DosBoxLoader. Does not want to process the command "imgmount d /emulator/example.iso -t iso"
Nice, you found another interesting bug. I've pushed a fix; let me know how it goes. Many thanks !!! Everything works fine !! !